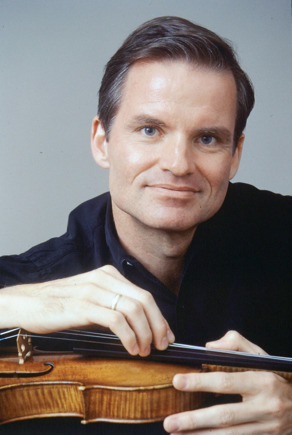 Curtis Macomber,violin, was praised recently by the New York Times for his playing's “thrilling virtuosity” and by Strad Magazine for its “panache”. He enjoys a varied and distinguished career as soloist, chamber musician, and teacher, and he has for several decades been recognized as one of this country’s foremost interpreters and proponents of new music. Mr. Macomber’s extensive discography includes the complete Brahms and Grieg Sonatas; violin concertos by Martin Boykan and Laura Schwendinger; and hundreds of critically praised recordings of contemporary solo and chamber works. His CD of Roger Sessions Solo Sonata was acclaimed by American Record Guide as “one of the best recordings of 20th Century solo violin music ever made.” A solo CD entitled “Songs of Solitude” was named by the New York Observer as one of 1996’s best instrumental solo discs ("Macomber's intensely human fiddle...seems an entire universe, sufficient unto itself."). He has recorded for Nonesuch, Koch, Bridge, Arabesque, Naxos and Musical Heritage and Albany; he has performed, commissioned, and made first recordings of solo violin and chamber works by, among others, Carter, Davidovsky, Perle, Wuorinen, and Mackey. Mr. Macomber is a founding member of the Apollo Piano Trio and a member of the Da Capo Chamber Players, the Manhattan String Quartet, the Walden Chamber Players and the New York Chamber Soloists. He was for many years the violinist of Speculum Musicae and has also appeared with the New York New Music Ensemble, Group for Contemporary Music, and in chamber music series across the country and in Europe. He has been a regular participant at La Musica in Sarasota, at the Yellow Barn Festival and at the Monadnock Music Festival. As first violinist of the award-winning New World String Quartet for 11 years (1982-1993). Mr. Macomber performed the standard repertoire as well as numerous contemporary works in performances in major halls throughout the United States and Europe, and, with the Quartet, was appointed Artist-in-Residence at Harvard University from 1982-1990; with that group he also recorded 14 discs and performed numerous times on Public Radio and Television in this country, and the BBC in Great Britain. Mr. Macomber is a longtime member of the chamber music faculty of the Juilliard School and the violin faculties of the Manhattan and Mannes Schools of Music, and has also taught at the Tanglewood Music Center and Taos School of Music. Other recent summer engagements have included Chamber Music Northwest and the Bard Festival. He holds his B.M., M.M., and D.M.A. degrees from the Juilliard School, where he was a scholarship student of Joseph Fuchs and winner of the Morris Loeb and Walter Naumburg Prizes.